Belleville FY is a slab typeface created by Benjamin Lieb together with Gia Tran and published by Fontyou that is available in 4 styles, in 4 weights, 16 vintage and modern fonts. Is good for any purpose, you can easily combine and create original sets. With a lot of Opentype features, Alternates, Swashes, Catchwords you can have crazy letterforms perfect for your projects (headline, magazine, display, logo, packaging, poster, title, signage etc.). Also it has four language support to ease your work. 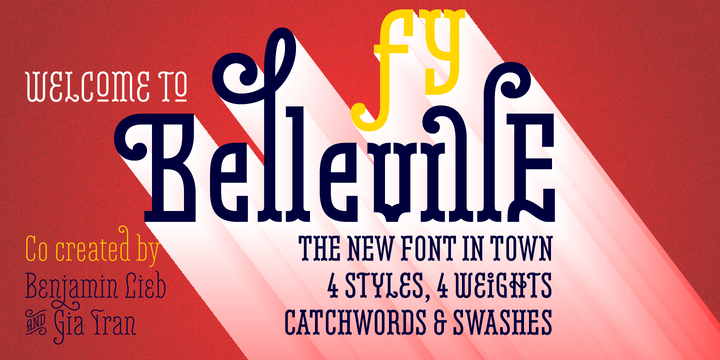 A font description published on Thursday, August 7th, 2014 in Fonts, Fontyou by Alexandra that has 4,495 views.